Jeanette asked to see Parisien architecture - et Voila! The crowds at Versailles have moved on to the Salon du Chocolat! A real chocolate map to help orient you at the fair... We begin with Beautiful cacao beans bien sur. Oui, this is where your chocolate comes from! Brazil lets you can taste raw beans right out of the pod. Mexico demonstrates the mole to make their version of hot chocolate (no milk included). Not ice cream, chocolate mousse flavors from Chapon. Many bouche at the Salon. Big mouthfuls of chocolateness = lunch. Talk about hunks of chocolate, as big as your head! And do not forget les bonbons. Oh that is why I think chocolate from France, Italy and Spain is better than British Chocolate!!! My husband normally brings me a huge bar back from his travels..I am very good, 1 bar can last me about a month!! You can almost smell the chocolate coming out of those glorious photos. Come on Carol, tell us how many you ate. My favorite post so far. I will have to go next year. May I assusme that you don't miss Halloween candy? Guess what my wordverfication was?
" R E E S E S "
If you find any good chocolate-peanut concoction (which I love! ), please let me know. I miss my Reeses Petnutbutter Cups. I used to steal them from my children's loot bag. What kind of wordverification are you using? It's so spooky!!!!! Reading my mind!!!!
" E A T I N "
I'm laughing at Merisi's comments. Wonderful chocolates, Carol--and the glasses--someone must have known you lost yours and then got new ones as well. Sounds like you're making all the right stops and getting the right kinds of sustenance. Fabulous! Happy Halloween! 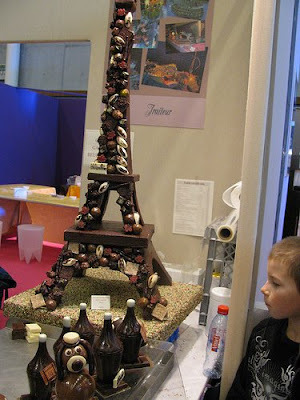 Wonderful pictures of the Salon du Chocolat!!! Wish I was there this year to put myself voluntarily in a cocoa induced coma! MERISI, The French do not care all that much for the peanut. They would certainly NEVER put it next to their chocolate in any form ever! If only l could get over to Paris Carol as l am allergic to cadburys chocolate and all the others like it, but french and German is fine with me. This series of posts has made me totally want to revisit Paris. I can only dream... and live vicariously through your posts! oh-my-god. Salon du chocolat. Can I live there? Can I stay there for a while? Can I eat everything in it? Please? May I just say I can't get enough of chocolate and I can't get enough of your BLOG! C'est Magnifique!!! I love reading this post. I'm impressed with all the ways chocolate are presented... tell us more *wink. Amazing Carol. How fun for you! I never tasted cacao out of the pod. Now I am curious. Im a fan of your blog and today I posted my 100 post, and I choose some beautiful images that I found in Blogland since I beggin my blog. Since your blog is one of my favorites, I used 2 of your paintings. Please come to see! Who needs m&m's when you could have a tower like that? You HAD to be there ! Nice show, could not go this year, but definitely one of my favorite exhibitions in Paris. Lady, You did a wonderful job on this blog. I spent Waaaay too much time on it but it was so interesting I had to pass it on to my friends.